Last year, a state audit found San Diego County agencies collected only 12 percent of domestic violence fund payments. Even with auditors’ recommendations implemented, it’s hard to tell how much collections have improved. It’s been more than a year since the California state auditor put San Diego County and the San Diego Superior Court on notice for failing to collect most of the money owed by people sentenced to probation for domestic violence offenses. Those funds go toward domestic violence shelters. The county and the court have taken steps to fix accounting practices that contributed to the problem. But the underlying cause of the auditors’ most significant finding — judges’ power to reduce criminal debts as they see fit — has not changed. And the county court system still lacks the technology needed to efficiently monitor payments. Even with most of the auditors’ recommendations fully implemented, it is not clear how much San Diego has closed the gap. Under state law, people who are convicted of domestic violence-related crimes and sentenced to probation are supposed to provide money to support state and local programs for domestic violence survivors, including shelters. The minimum assessment has changed several times over the last two decades, but it’s never been higher than $500. There was some confusion over whether the payment was a fee or a fine, but the state Legislature cleared that up with a bill Gov. Jerry Brown signed into law this August. When the law goes into effect in January 2014, the payment will be considered a fee. That’s supposed to increase funding for domestic violence shelters. Judges have “discretion to reduce or waive the fee” if defendants don’t have the “ability to pay.” But when judges broadly interpret this rule, it can significantly affect the amount of revenues that are brought in. The state auditor’s office reviewed a total of 135 domestic violence cases in four counties — San Diego, Los Angeles, Sacramento and Santa Clara — to figure out how good the agencies were at collecting payments from probationers. All of the counties fared poorly, but San Diego’s collection rate was the worst. Collection methods varied among the counties because the state had not set clear guidelines for all of them to follow, and because the mix of agencies responsible for collections was different in each county. 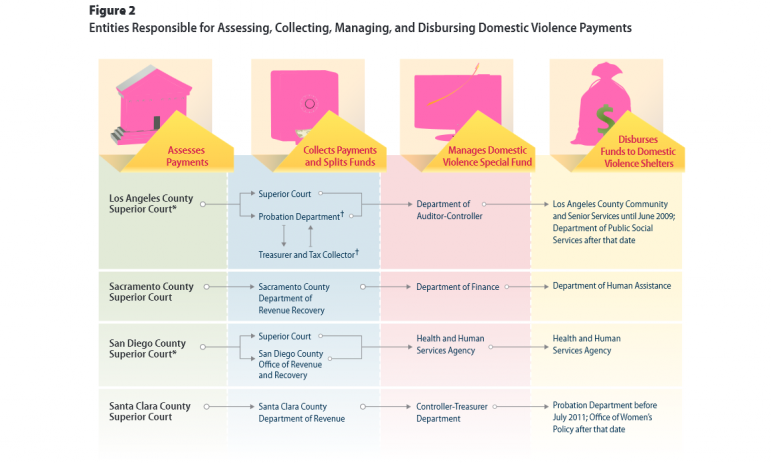 Auditors mapped out how each county collected and distributed domestic violence funds. In San Diego County, the collections function is shared by the Superior Court and the county’s Office of Revenue and Recovery. The county’s Health and Human Services Agency distributes funds to domestic violence shelters. • Although defendants’ inability to pay fines has long been touted as a major factor behind low criminal debt collections nationwide, the auditors found that judges had reduced debts by as much as 43 percent for those who could afford to pay. • Upon sentencing, defendants did not receive an itemized list of each debt they were obligated to pay the court. • The court did not consistently create records to track defendants’ payments at the time of sentencing. Michael Roddy, the court’s executive officer, told VOSD that the court has implemented all of the auditors’ recommendations. But Roddy said he’d be “surprised if there’s a huge impact” on collections. Two things haven’t changed: The court’s payment-tracking software and judges’ discretion to reduce fines in individual cases. Both could undermine the court’s collections rate. Roddy said the court was still unable to electronically “track what’s ordered versus what’s paid,” and that “the auditors physically had to get the files” in order to calculate the collections rate. Since the audit, the court’s collections success rate for all debts was 53 percent, according to a financial snapshot that Roddy provided to VOSD in response to a public records request. Domestic violence funds are lumped into these figures somewhere, but they are not listed specifically in the financial report. Sean Sander, the director of the county’s Office of Revenue and Recovery, said his office had addressed most of the auditors’ concerns. But the court’s lingering issues will affect how his office can collect domestic violence fees. Sander’s office is developing a compliance and quality-assurance unit to “monitor all collection types,” but he said there’s no way for his office to calculate the collections rate for domestic violence funds accurately if judges reduce probationers’ fees before his accountants start tracking those payments. “We only get what we get from the courts,” Sander said. The county and the court have discussed how to improve the system, and both parties are, in theory, on board. But neither Roddy nor Sander can tell judges not to reduce domestic violence fees in individual cases. Joel Hoffmann was formerly an investigative reporter for Voice of San Diego, focusing on county government, the San Diego Unified School District and the Unified Port of San Diego.